The holiday season moves into full swing this month with our an­nual celebration of Thanksgiving. It is marvelous to be able to have an attitude of gratitude. God is our provider, the giver of all good gifts, so when it comes to giving thanks, our first expression of gratitude should be directed to almighty God. Jesus stressed the importance of thanking God when he asked the Samaritan leper who had been healed, “Has no one but this foreigner returned to give thanks to God?” (Luke 17:18). St. Paul taught: “Be thankful” (Colos­sians 3:15); “Sing hymns with gratitude” (Colossians 3:16); and “Whatever you do, in word or in deed, do everything in the name of the Lord Jesus, giving thanks to God the Father through him” (Colos­sians 3:17). When it comes to gratitude, the first step is the ability to recognize our blessings. If there is no awareness of gifts received, there is no need to offer thanks. As Thanksgiving draws near, set aside a few moments to spiritually prepare for the holiday. Pause to count your blessings. Consider life and health, family and friends, talents and abilities, opportunities and accomplishments, financial and material blessings. And do not forget to count your spiritual blessings: the Father and creation, Jesus and the Gospel, the Holy Spirit and inspiration, Word and sacrament, faith and grace, forgiveness, redemption and salvation. Apart from God, we would have nothing. God has blessed us with everything that we have. As we become increasingly aware of our countless blessings, it should lead us to give God greater praise and thanks, and our gratitude is best expressed in prayer. The Greek word “eucharistos” means “thankful,” and as Catholics we believe the best way to thank God is at the Eucharist, our prayerful celebration of the Mass. St. Paul also recommends hymns and the psalms, sung at Mass or anywhere. It is also an excellent spiritual practice to thank God in our personal private prayer each and every day. Consider making prayer a central part of your celebration of the Thanks­giving holiday. The ideal way would be to attend Mass. 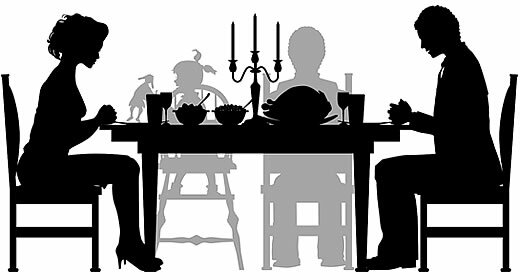 Also, before sitting down to your Thanks­giving dinner, take a moment as a group to offer thanks with your meal prayers. Sometime between rising and retiring, take a quiet, private moment to offer God your own personal prayer of thanks.